The Space Science Center fosters research and graduate education in all of the space sciences with studies ranging from the ionosphere to the Earth's magnetosphere, the local solar system, and out to the farthest reaches of the universe. Investigations of the Earth's environment in the solar system look at space as a laboratory for plasma physics. We conduct theoretical and satellite investigations of the solar-terrestrial radiation environment. High energy astrophysics investigations involve the sensing of energetic astrophysical objects with ground, balloon, and satellite detectors. Satellites from NASA missions are still providing data for ongoing analysis. Recent missions that are carrying EOS-related instruments are STEREO (launched 2006), IBEX (launched 2008), LRO (launched 2009), RBSP (launched 2012), FIREBIRD (launched in Dec. 2013), MMS (launched in 2015), and FIREBIRD II (launched in 2015). 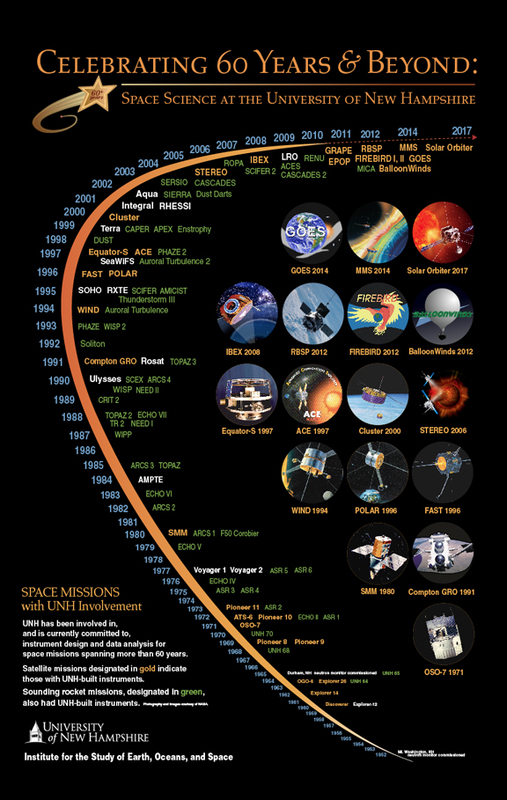 Upcoming missions for which EOS is building instruments: GOES-R (launching in 2016). The Space Science center is also a Center of Excellence in theoretical Solar-terrestrial research. Faculty and students are members of the Department of Physics, with a graduate degree program specializing in Space Physics/Astrophysics. MMS research featured in Science (5/12/2016). . . Recent Space Science Center Publications . . .